It is very frustrating that after putting too much of your effort, time and full concentration in performing a repair thinking that at the end you will have dealt with it once and for all but you end up having to repeat the whole process once again.in most of the cases, this is usually brought about by under-tightening or over-tightening of nuts and bolts which will then cause breakages or damages in the parts we are repairing. This is why torque wrench is a tool that you will always have to use when tightening or loosening nuts and especially when the tightening is supposed to meet an exact specification. 1/4-inch drive torque wrenches. It is used when small amounts of torque are required like when tightening small nuts and bolts found in thing like motorcycles and garden equipment. 3/8-inch drive torque wrenches. Its usage is mainly on light trucks. 1/2-inch drive torque wrenches. when dealing with large equipment, SUV’s and trucks, this is the size of torque wrench you will require. 1-inch drive.it is usually used when dealing with Large Cargo Aircraft, trailers or basically all heavy vehicles. There are also five types of torque wrenches. Depending on which one is suited for your job, you have to choose which torque wrench to use. Clicker type wrench. 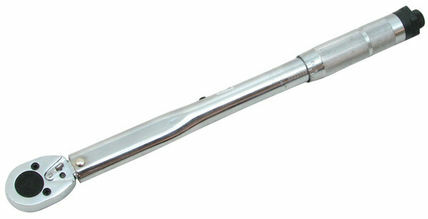 It is the most widely used torque wrench product which is also very popular. When using this type of torque wrench a clicking audible sound is created by it which alerts you when the set value is reached. Beam type wrench. This torque wrench uses a pointer which points at a certain reading depending on the amount of torque. When using it one has to constantly keep on looking at the pointer to have an end accurate reading. Dial type. This type of torque wrench is very durable and robust. This is due to the heavy meatal guard in it. Electronics with digital read out. Though it being expensive, it is actually the most reliable torque wrench especially when angle plus torque is required. Torque is also displayed digitally using an LED display making the user to easily and quickly see the readings. Why is torque wrench important? It ensures the fasteners longevity through preventing over-tightening of them. For example, if you over-tighten a screw its threads may end up being damaged. When proper torque wrenches are used, premature failures are avoided. These failures are caused by not using the specified torque measurements provided by the manufacturer of each fastener. This makes the fastener not able to hold heavy vibrations leading to sudden un-expected failure.